Thousands Of Protesters Are Marching Nationwide Demanding "Justice For All"
Thousands are taking to the streets of the Washington D.C. and New York to demonstrate against recent police action against minorities, including the deaths of Michael Brown and Eric Garner. Protesters are marching on Washington D.C. and in cities nationwide in what organizers hope will be one of the largest demonstrations against police tactics used on black men. More than 25,000 people attended the protest in New York City, The New York Times reported. The number reported by the Time is more than double what police initially told reporters. Many participants estimated even higher numbers and the Times reported that the procession stretched more than a mile. A protest took place Saturday afternoon in Los Angeles on Hollywood Boulevard. Cast members from Netflix's hit show Orange Is The New Black participated in the march Saturday in New York City. 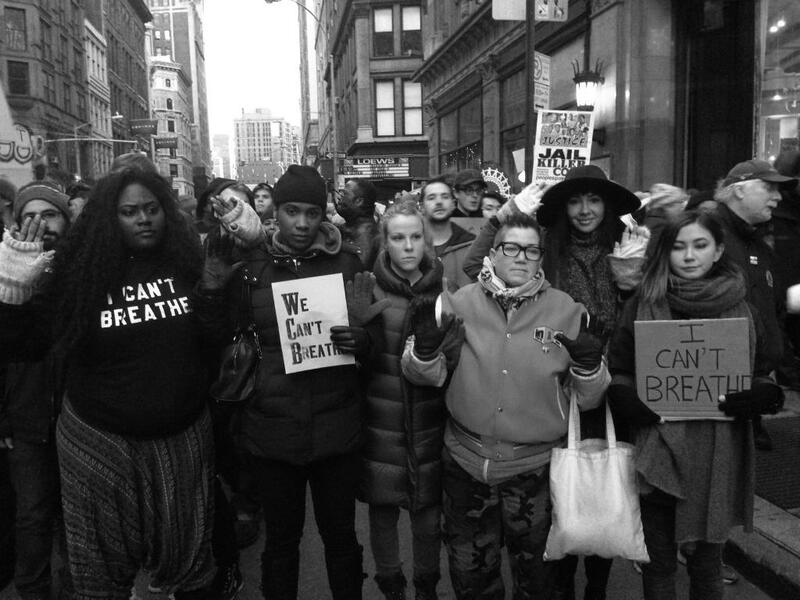 Vicky Jeudy, who plays Janae Watson on the show, tweeted a picture of several cast members holding "I Can't Breathe" signs in New York. Cast members also were spotted by participants Saturday. 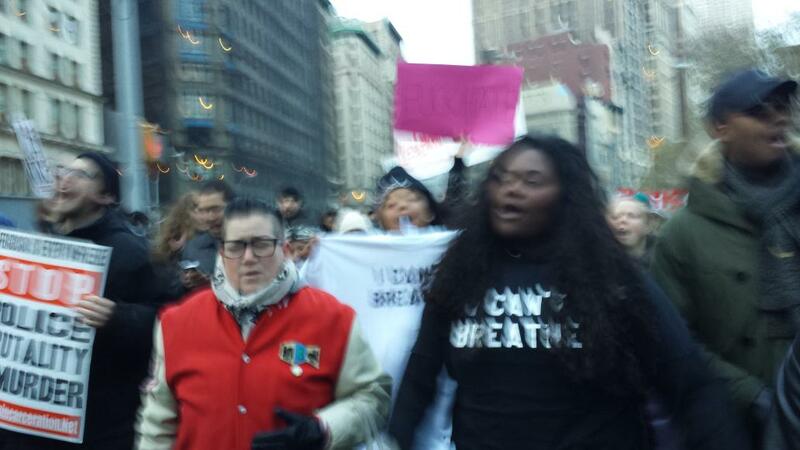 Orange is the New Black star among protesters. 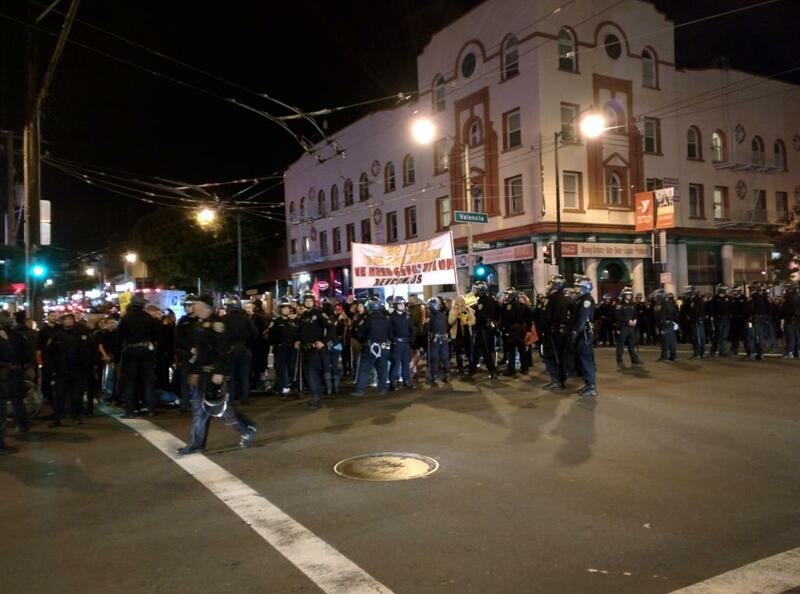 A protest in Oakland continued well into the evening, with protesters marching through the streets while news helicopters hovered overhead. Protesters remained active in Washington, D.C., Saturday evening, peacefully facing off with police outside the Capitol. A time lapse video shot in New York City Saturday showed thousands of demonstrators filling 6th Avenue. 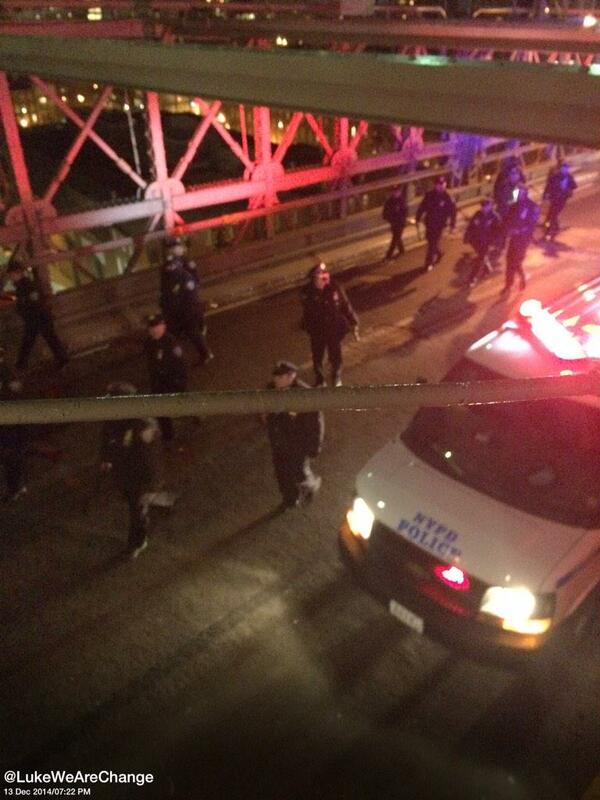 Demonstrators in New York City closed down parts of the Brooklyn Bridge Saturday evening, witnesses and journalists at the scene reported. The names and faces of the victims were everywhere. On signs, in chants, on clothing and pins. 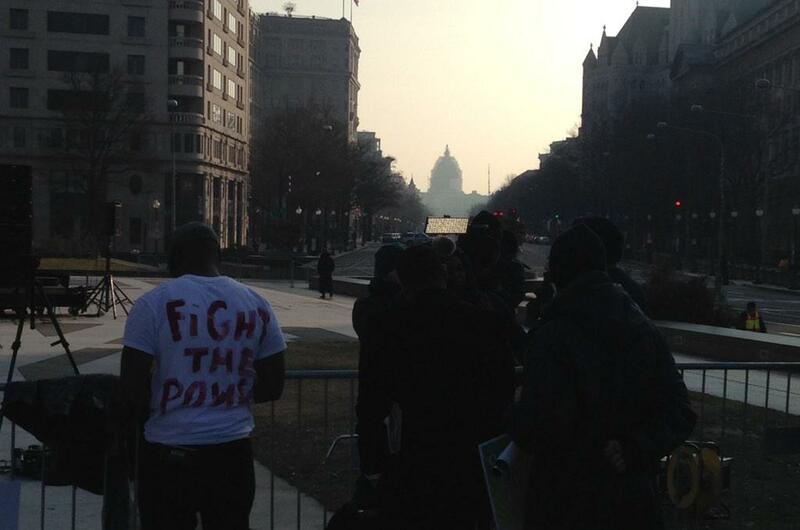 As the marchers filed out, away from the Capitol, back up Pennsylvania Avenue, they passed vendors selling shirts, hoodies, framed posters, 2015 calendars, gloves, lanyards, hand-warmers, key-chains&mdash;nearly all bearing "Hands up, don't shoot" or "I can&#39;t breathe" or "Black lives matter." 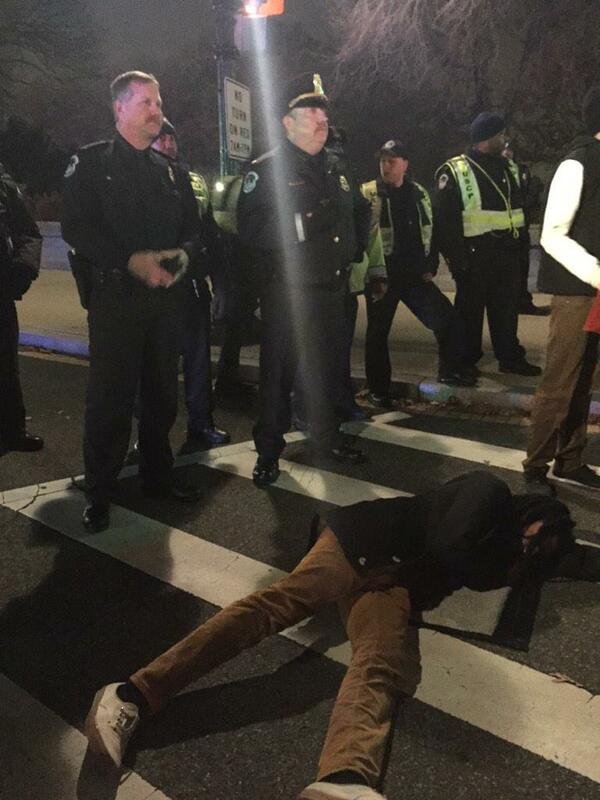 Click here to continue reading BuzzFeed News Reporter Albert Samaha&#39;s account of the protests in Washington, D.C. In New York City, several cast members of Orange Is The New Black came out to call for an end to police violence. Eric Garner's widow and mother travel to Washington D.C. to participate in the protests and gave speeches urging Congress to work harder to protect black people from unjustified police violence. Esaw Garner, the widow of Eric Garner, speaks during the National Action Network National March Against Police Violence in Washington Dec. 13. Gwen Carr (C), the mother of Eric Garner, speaks during the National Action Network National March Against Police Violence in Washington. In New York City, protesters shared the streets with hundreds of people dressed as Santa Claus for the annual bar-crawl event "Santa Con." Well, I tried to cover the protest from a certain angle. 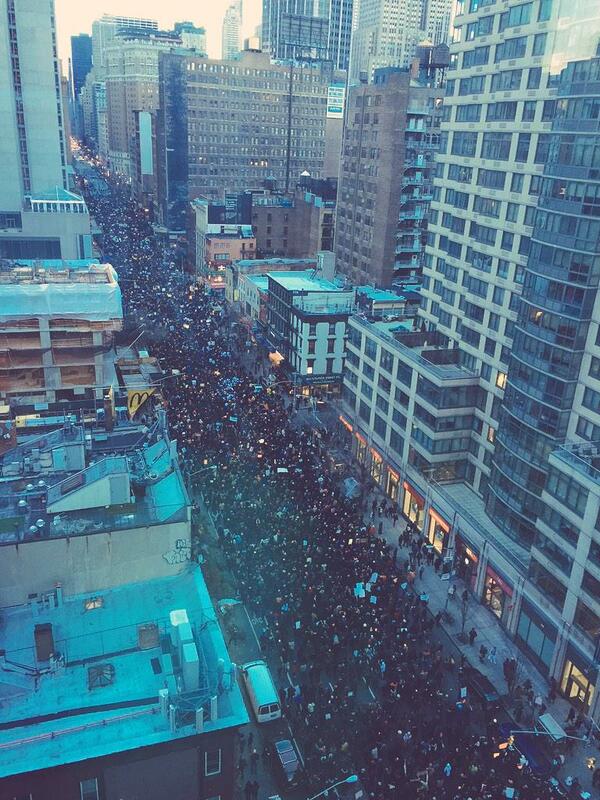 Police told a Mashable reporter that they estimated 12,000 people showed up to protest in New York City. Here is the planned route for demonstrators in New York City. 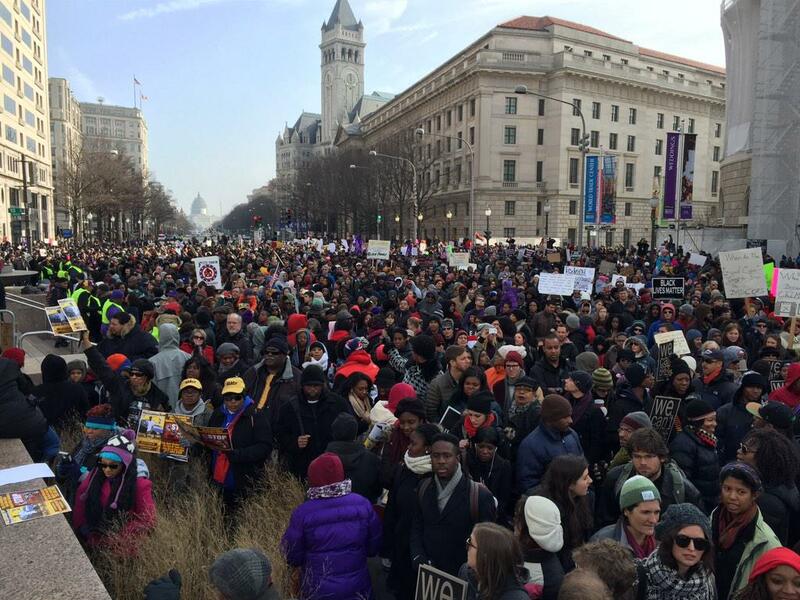 By 2 p.m., several thousand people were walking through the streets of Washington D.C.
.@nettaaaaaaaa finally got the mic at Freedom Plaza in D.C. 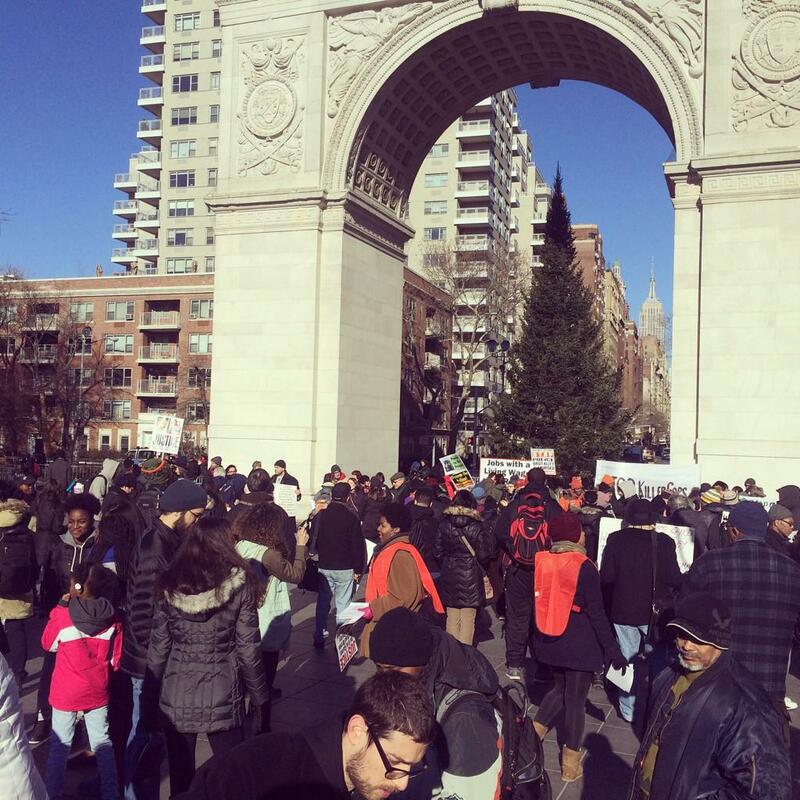 In New York City, protesters flooded Washington Square Park. 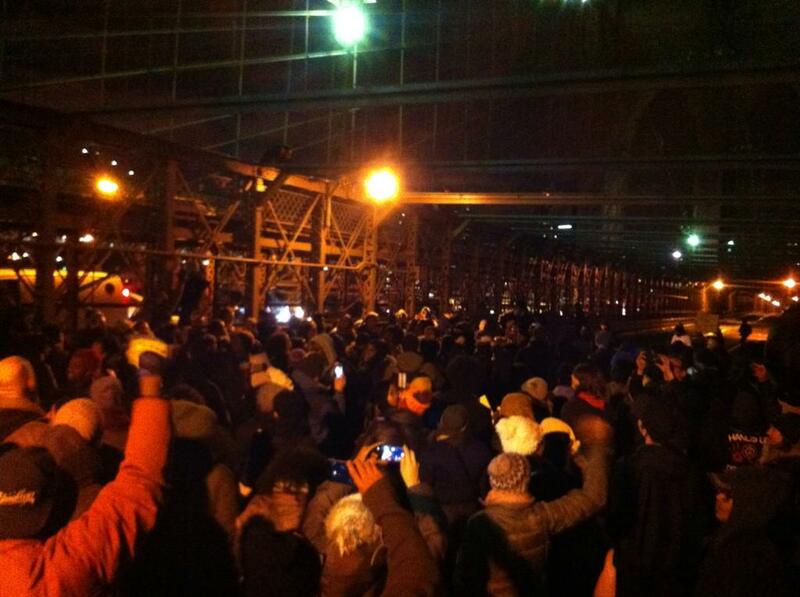 Watch live video footage from the protests here. 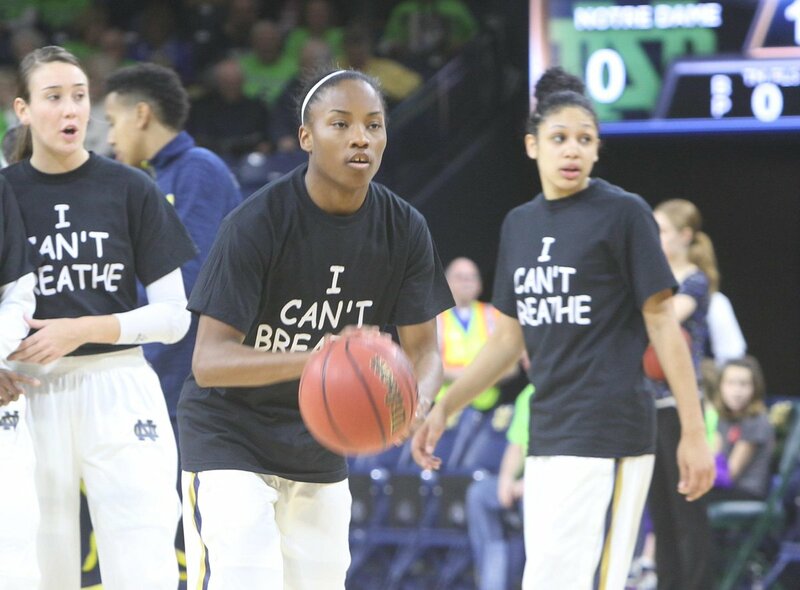 Members of Notre Dame's women's basketball team have become the latest sports players to wear shirts emblazoned with the last words of Eric Garner. 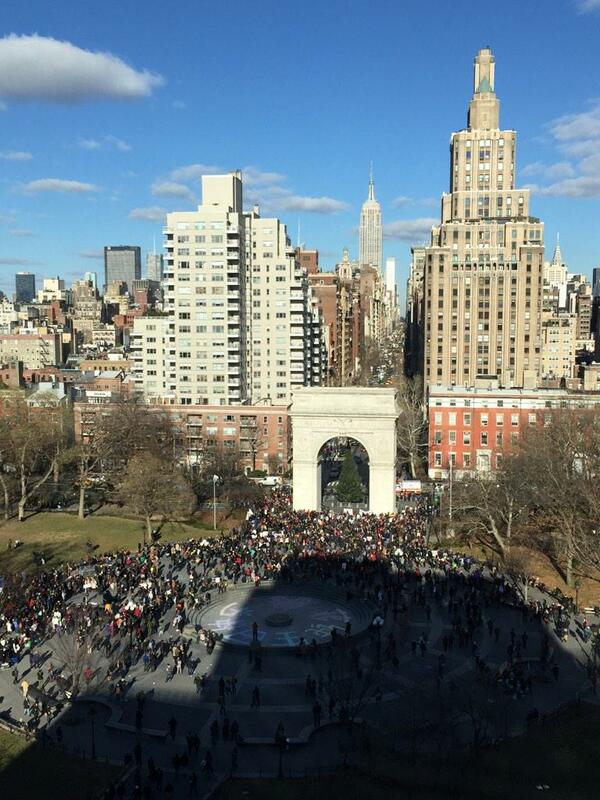 Demonstrators have gathered at Washington Square Park in New York City to kick off a lengthy march through Manhattan. Protesters in Washington D.C. have paused before the Capitol building to listen to speeches, including one delivered by Rev. Al Sharpton. 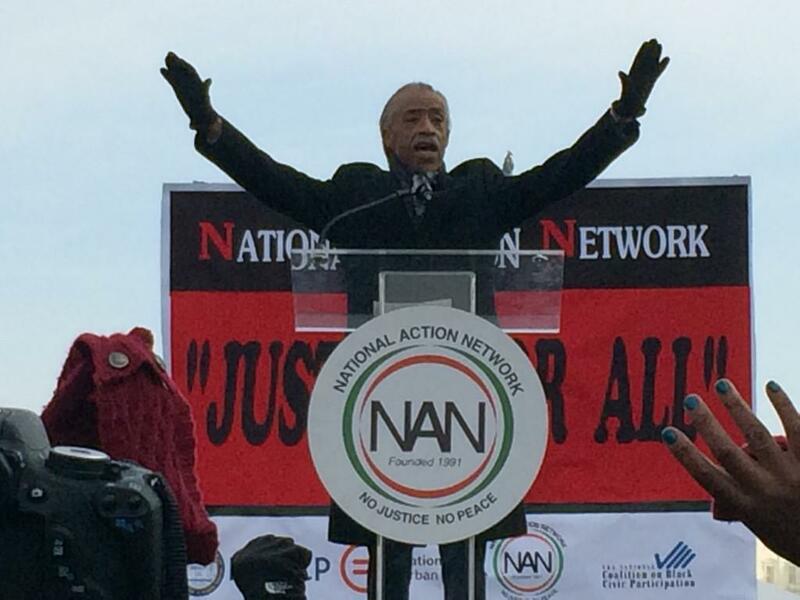 "This is not a black march or a white march," Sharpton told the crowd, according to the Washington Post. "This is an American march so the rights of all Americans are protected. 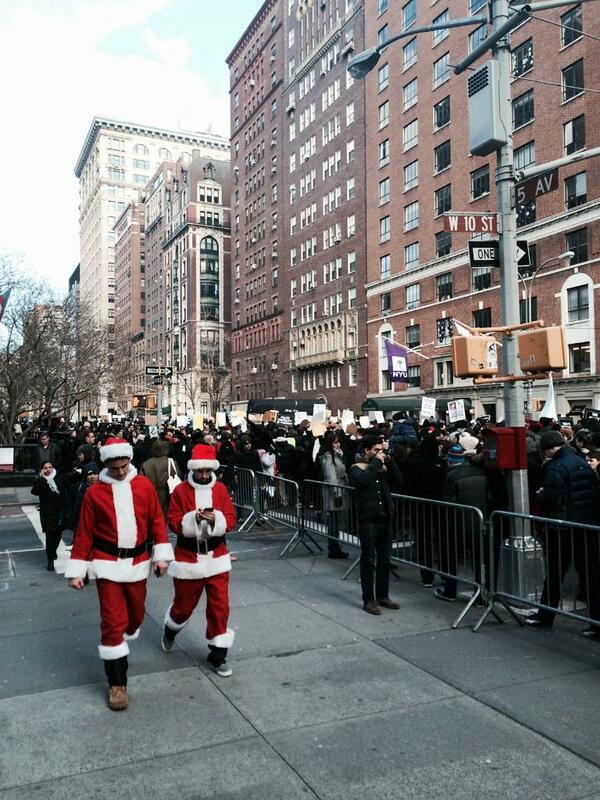 I'm inspired when I see white kids holding up signs saying &#39;Black Lives Matter.&#39;"
A march is scheduled to get underway shortly in New York, but protesters will have to share the streets with thousands of Santas. 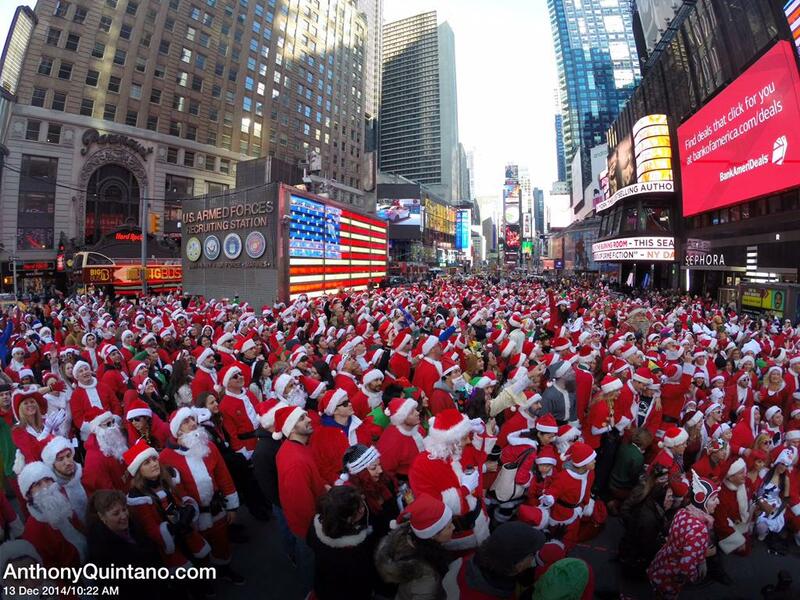 The annual drunken mess that is SantaCon is also happening today, with people dressing up in Santa costumes for a massive, day-long bar crawl. 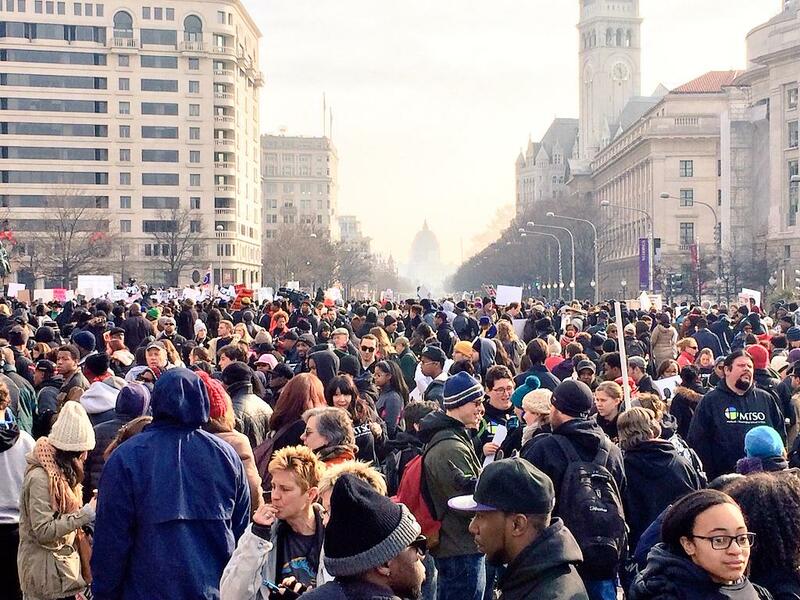 The crowd began marching down Pennsylvania Avenue shortly after noon on Saturday. 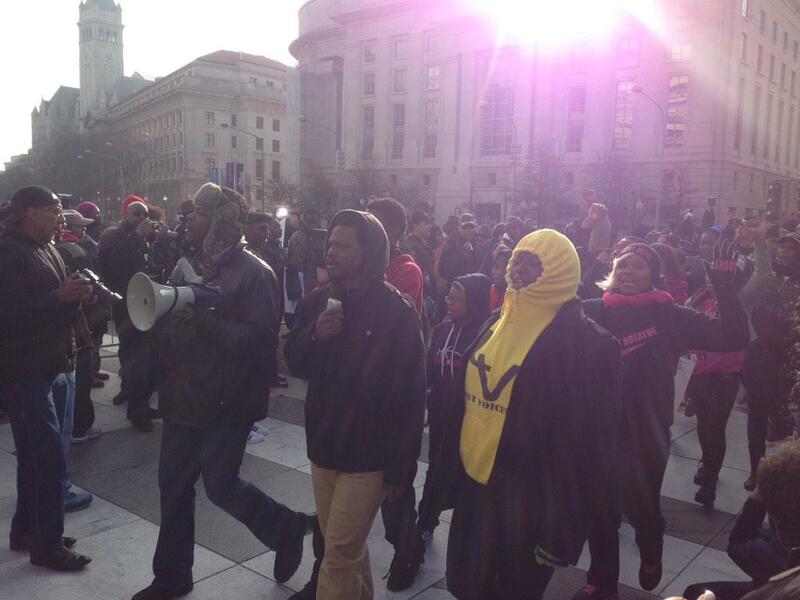 Among those marching in Washington D.C. was Lesley McSpadden, the mother of Michael Brown. The crowds are preparing to march past the Department of Justice building and on to the Capitol building. Speakers taking the stage. "We will not stop until Congress implements policy that makes police officers accountable for their actions." Protesters on stage finally given chance to speak. 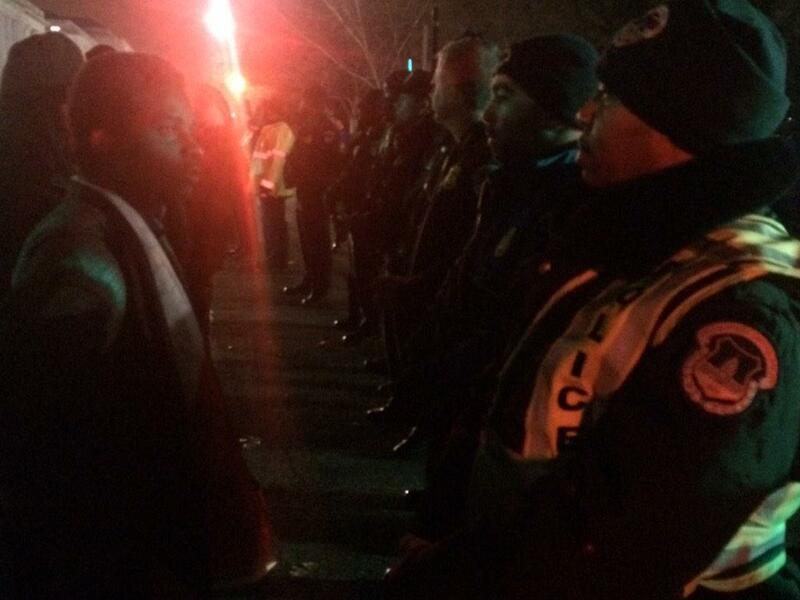 "We're not being disrespectful... We've been protesting for a hundred & something days." Names of slain unarmed black men were read outside of Freedom Plaza in D.C.
More from Freedom Plaza in D.C.
D.C. &#x2014;&#x3E; RT @ryanjreilly: Freedom Plaza. 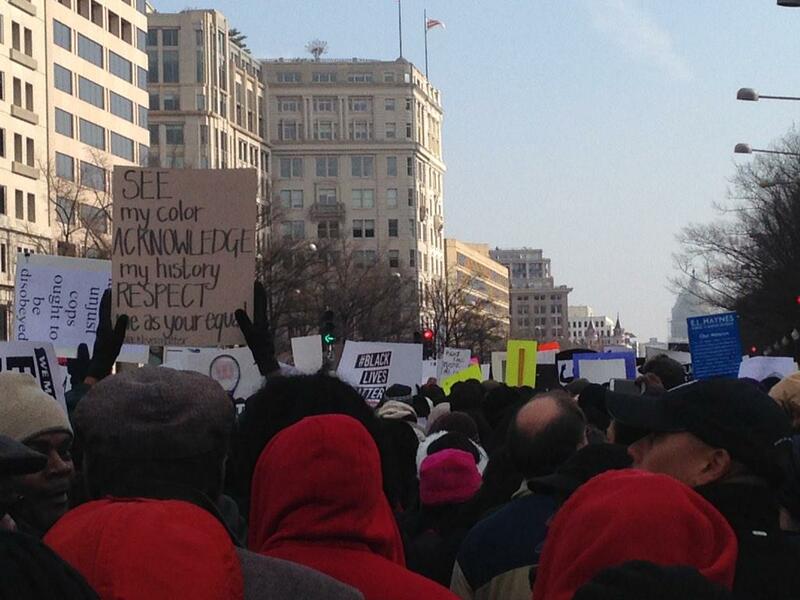 D.C. —> RT @ryanjreilly: Freedom Plaza. BuzzFeed News reporter Albert Samaha will spend the day among the protesters. Follow him on Twitter for live updates from the scene. On Saturday, Rev. Al Sharpton will lead a civil rights march through Washington D.C., which organizers hope will be among the largest demonstrations against police tactics used on black men. Protesters have been bussed in from New York City to attend the "Justice For All" march, which will end in front of the U.S. Capitol building. Demonstrations are also scheduled in San Francisco and New York, where a "Millions March NYC" event is planned to join in solidarity with the "Justice For All" march. Protests are also slated in Lexington, Kentucky; Austin, Texas; and in Kansas City, Missouri, the Washington Post reported. The protests are designed to bring attention to the recent grand jury decisions to not indict the officers who killed two unarmed black men: Eric Garner of Staten Island, New York, who was placed in an illegal police chokehold; and Michael Brown of Ferguson, Missouri, whose death in August triggered protests and riots in St. Louis and throughout the nation. Others recently killed by police include 12-year-old Tamir Rice, who was shot for holding an airsoft pellet gun, and John Crawford III, who was gunned down in a Walmart while holding a toy rifle. Contact Austin Hunt at austin.hunt@buzzfeed.com.